This fresh-tasting cookie is a perfect accompaniment to your morning tea or coffee. The Satsuma mandarin flavor is a perfect complement to the sea salt. Wash the Satsuma mandarins. Cut them into very thin slices and place on a paper towel. Before placing them on the cookies, flip them over onto a fresh paper towel to dry the other side a bit, too. In a bowl with an electric mixer, beat the softened butter with 1 egg until light and fluffy. Add the almond flour, sea salt, sugar, flour, 1 tablespoon orange zest and 2 tablespoons juice. Mix until the dough comes together. Shape the dough into a roll, about 2 inches in diameter, cover with plastic wrap and refrigerate for at least 1 hour. Slice the dough roll into 1/4-inch thick cookies and place on a baking sheet. Using the bottom of a drinking cup with a bottom about 1 1/2 inches in diameter (or approximately the diameter of the mandarin slices), dip the bottom of the glass into a bowl of sugar and press into the cookies, making a small indentation. With the remaining egg, separate the egg, keeping the yolk. Brush the top of each cookie with the beaten egg yolk. Put one slice of mandarin orange in the indentation on the top of each cookie. Sprinkle with raw sugar and bake for 15 minutes, until just golden brown. Remove cookies and place on a cooling rack to cool, then sprinkle with powdered sugar. 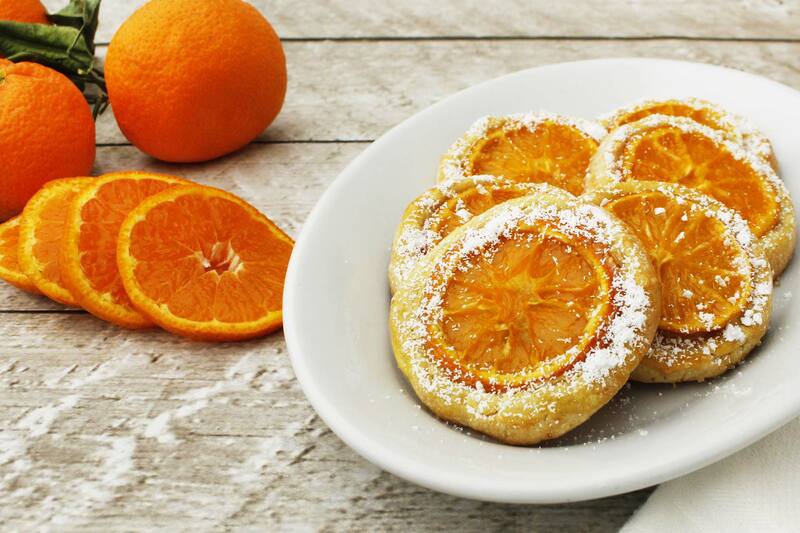 We know you typically wouldn't eat the rind on a mandarin, but as long as you slice them very thin, they turn out delicious in these cookies.